Iraqi soldiers carry coffins containing the remains of ten of their comrades who were killed in Camp Speicher massacre. Salahuddin – (IraqiNews.com) High Commission for Human rights announced on Wednesday pulling bodies of 25 victims of the massacre of Camp Speicher from Tigris River in Tikrit, and pointed out that it is keen to reveal the crimes, genocides and violations committed by the Islamic State extremist group. “These efforts allowed the divers of River Emergency Directorate to pull the bodies of 25 victims of Camp Speicher massacre and handed them to Salahuddin Police Directorate,” the release explained. The commission also renewed its condemnation of the dangerous violations committed by ISIS terrorist gangs, including genocides and crimes against humanity, and emphasized its humanitarian and national role to serve the Iraqi people. On 12 June 2014, the Islamic State extremist group (ISIS) killed at least 1,700 Shia Iraqi Air Force cadets in an attack on Camp Speicher in Tikrit. On 12 June 2014, the Islamic State of Iraq and the Levant (ISIS) killed at least 1,566 Shia Iraqi Air Force cadets in an attack on Camp Speicher in Tikrit. At the time of the attack there were between 4,000 and 11,000 unarmed cadets in the camp. Alleged ISIS fighters singled out Shia and non-Muslim cadets from Sunni ones and murdered them. The Iraqi government blamed the massacre on both ISIS and members from the Arab Socialist Ba’ath Party – Iraq Region. “Some of the chief officers of the camp ordered the cadets to have a rest for 15 days and to go to their families, with civilian clothes. While they were walking on the highway looking for a bus to take them near Baghdad. Then two buses being driven by Ayman Sabawi Ibrahim, the son of Saddam Hussein‘s half brother, Sabawi Ibrahim al-Tikriti, stopped near them with 10 armed men inside of them. Several survivors assured that their head officers in the camp forced them to leave it. “The photos and satellite images from Tikrit provided a strong evidence of a horrible war crime that needs further investigation. [ISIS] and other abusive forces should know that the eyes of Iraqis and the world are watching”. The HRW also said that ISIS posted on its websites many videos and photographs showing how they beheaded, shot, and choked the victims while they celebrated. The photos show masked ISIS fighters tying up the cadets and loading them up on trucks, with other photographs showing ISIS fighters executing dozens of the cadets while they are lying down. ISIS propaganda videos show them shooting at hundreds of lined up men in mass graves in the desert. Some cadets faked their death, covering themselves with blood and lying down to escape at night. Survivor Ali Hussein Kadhim told his story to the New York Times following his escape from the massacre. The Islamic State released the videos, as part of their propaganda video titled ‘Upon the Prophetic Methodology’. The cadets are seen to be cramped upon trucks, some of them wearing civilian clothes to hide their actual military uniform. Most of them lied on the ground, with their jeans stripped to reveal camouflages underneath. Some of the prisoners were forced to decry Iraq’s prime minister, others forced to say ‘Long Live the Islamic State’. Some of them lined up as a cadet was bashed with a rifle. The executions vary, from shooting them one by one to shooting them while lying down many times to ensure death. The Iraqi government revealed that 57 members of Arab Socialist Ba’ath Party – Iraq Region were a part of the massacre. The minister of defence, Sa’dun al-Dulaimi, stated that the massacre wasn’t sectarian in nature. although, the spokesman of the Iraqi Armed Forces, Qasim Atta, stated that there are almost 11,000 cadets and soldiers missing from Camp Speicher, he also stated that thousands were executed in near the Presidential Palaces, al-Bu Agail region and the Badoush prison by sectarian violence. On 2 September, more than 100 members of the families of the killed and missing cadets and soldiers broke into the Iraqi Parliament and hit three of the security guards. After a day, a session started in the parliament with the attendance of representatives of the families and Sa’dun al-Dulaimi, along with other military officials to discuss the massacre. The Iraqi government ordered to pay 10,000,000 IQD (equivalent to US$8,600) to the families of the missing cadets. Following the Iraqi forces’ victory over ISIS in Tikrit in early April 2015, mass graves containing some of the murdered cadets were located and the decomposed corpses began to be exhumed. Two of the alleged perpetrators of the massacre were arrested in Forssa, Finland, in December 2015. The suspects were identified from ISIS propaganda videos in which the executions of 11 men took place. Police did not disclose whether the men had made applications for asylum in Finland. In August 2016 thirty-six men were hanged for their part in the massacre. On 6 September 2016, mass graves were found by the Kata’ib al-Imam brigade containing the remains of over 30 people killed in the massacre. Of the 600 people wanted by Iraqi authorities in connection with the massacre, only 24 people have been convicted so far. 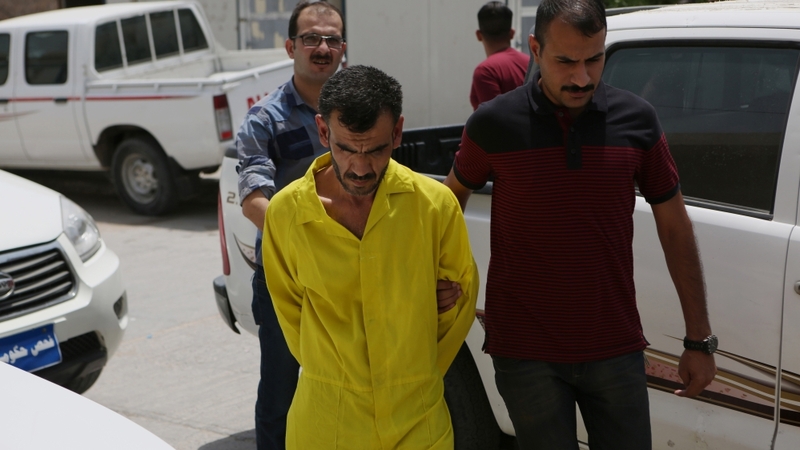 In July, a group of 28 men went on trial in Baghdad over the Camp Speicher killings, all but four of the men were given death sentences, with the remainder acquitted for lack of evidence. The sentencing was greeted by cheers from the families of victims present, with many shouting “God is Great” and “Ya Hussein”, in reference to a revered Shia figure.